Department of Mathematics, Faculty of Science, University of Jiroft, Jiroft, Iran. The main goal of the present paper is to extend classical results from the measure theory and dynamical systems to the fuzzy subset setting. In this paper, the notion of dynamic equivalence relation is introduced and then it is proved that this relation is an equivalence relation. Also, a new metric on the collection of all equivalence classes is introduced and it is proved that this metric is complete. G.A. Afrozi, S. Shakeri, and S.H. Rasouli, On the fuzzy metric spaces, The Journal of Mathematics and Computer Science Vol .2 No.3 (2011) 475-482. J.R. Brown, Ergodic theory and Topological Dynamics, Academic Pres, New York, 1976. D. Dumitrescu, C. Haloiu, and A. Dumetrescu, Generators of fuzzy dynamical systems, Fuzzy Sets and Systems, 113 (2000) 447-452. M. Ebrahimi, U. Mohamadi, m-Generators of fuzzy dynamical systems, Cankaya University Journal of Science and Engineering, 9 (2012), 167-182. P.R. Halmos, Measure Theory, Springer-Verlag New York, 1950. P.E. Kloeden, Fuzzy dynamical systems, Fuzzy Sets and Systems, 7 (1982) 275-296. 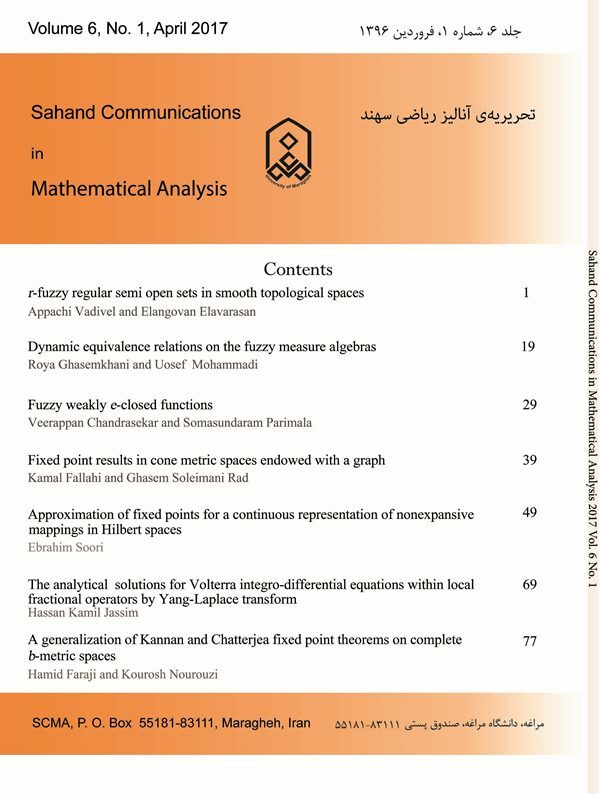 U. Mohamadi, Weighted information function of dynamical systems, Journal of mathematics and computer science, 10 (2014) 72-77. P. Walters, An Introduction to Ergodic Theory, Springer Verlag, 1982. L.A. Zadeh, Fuzzy Sets, Inform. and control, 8 (1965) 338-352.